The game delivers a thrilling narrative driven by player choices. Players explore a world of wonder and danger, unlocking curious discoveries. 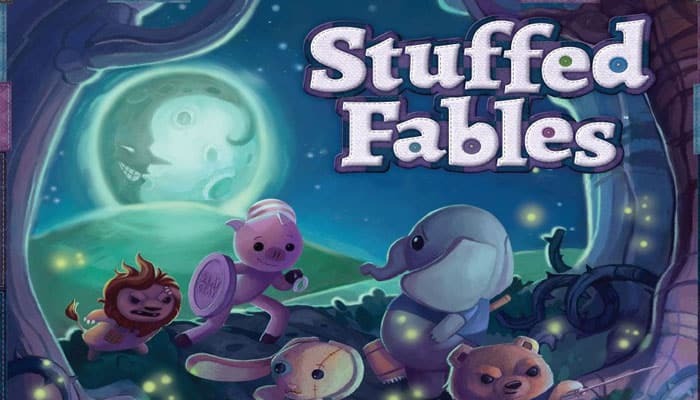 The chapters of Stuffed Fables explore the many milestones of a child's life, creating a memorable tale ideal for families, as well as groups of adults who haven't forgotten their childlike sense of wonder. 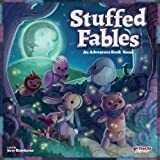 Stuffed Fables is the first "AdventureBook Game", a new product line from Plaid Hat Games in which all of the action takes place in the unique storybook - a book that acts as your rules reference, story guide, and game board, all in one! Each adventure in the game takes place over several pages of the immersive AdventureBook. The book opens flat onto the table to reveal a colorful map or other illustration central to playing the game, with choices, story, and special rules on the opposite page. On their turn, a player draws five dice from the bag. The colors of the dice drawn determine the types of actions and options available to the player. White dice can re-stuff stuffies injured in battle. Red dice perform melee attacks while green dice perform ranged attacks. Yellow dice search while blue dice are used for special actions and purple dice can be used as any color. Most dice can always find a strategic use, including moving, using items, or contributing to group tasks. Players can store dice for later, combine dice for stronger actions, or use them one-at-a-time for multiple activations. As turns go by, black dice are also drawn, and after enough appear, minions emerge or attack, and the dice bag is reset! Stuffed Fables is a cooperative adventure game for 2-4 players. Players take on the roles of a young girl's stuffed animals, who are tasked with protecting the child from the minions that lurk under her bed. Using teamwork, courage, compassion, and a little luck, the stuffies will explore their way through a series of interactive stories. Adjacent: The 8 spaces that are pointed to in the example are adjacent to the space with the figure on it. Attribute Dice: Dice that allow you to perform actions on your turn. They are red, green, yellow, blue and purple. Button: A form of in-game currency that a player gets each time her stuffy defeats a minion. The game will inform players on when they can spend buttons. Collapsed: A stuffy that has lost all of its stuffing has collapsed.